I’m back with another book review, but this time it’s going to be a book and a movie review. I haven’t done a combined one in a while because usually these reviews don’t coincide and usually I don’t get to watch the movie until much later. Lucky for me the movie was available on Crackle, which is probably the only reason this movie review is here. 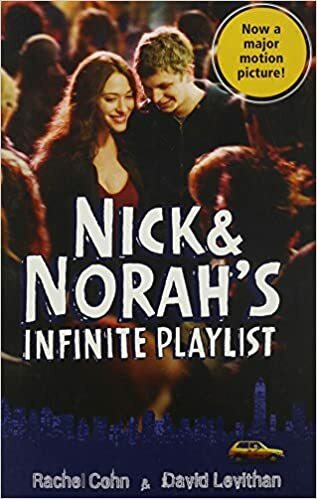 The book/movie I’m reviewing today is Nick & Norah’s Infinite Playlist by Rachel Cohn & David Levithan. This book had gotten so much hype when the movie came out that I knew that I would have to read it at some point. Let’s start with the synopsis: The quick rundown of the main storyline is that Nick & Norah meet at a club in New York City while they are both avoiding their ex’s. Nick’s ex being Tris and Norah’s ex being Tal meanwhile Norah’s friend,Caroline gets blackout drunk and has to be taken care of. This is about where the book differs from the movie. In the book, we find the band Where’s Fluffy, on the first try, namely at some underground club in New York City and the next thing you know Nick & Norah are chasing each other around the city and falling in and out of love. In the movie, they spend nearly the whole movie searching for Where’s Fluffy and Caroline ( she escapes from Nick’s friends and the wanders around the city drunk). Now aside from the majorly over the top gross scenes with Caroline’s gum ( I don’t even know where to start!) The movie was mildly entertaining for a teenage flick. It was a bit annoying to spend the whole time wandering around looking for a band to play at some pop-up spot. One thing good about the book and the movie is that they both revolve around music. The fact that Nick plays in a band, Norah’s dad is a record executive and that they both are obsessed with Where’s Fluffy. Not to mention that Norah is really obsessed with the mix cds that Nick has been making Tris. Overall, if you wouldn’t mind reliving the crazy music of your youth or are still there this is the book/movie for you. I would definitely recommend the book over the movie. Let me know if you have read the book or watched the movie and what you thought. Did you like Kat Dennings and Michael Cera in the roles of the main characters or would you have picked other people? I have a few more books by Rachel Cohn & David Levithan on my TBR pile, so I’ll probably check them out sometime this year. Let me know which one you would recommend first. I hopefully will see you in another post soon.